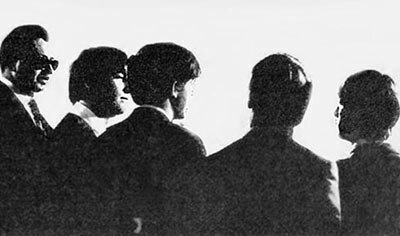 ABOUT THIS INTERVIEW: On February 12th 1964, the Beatles chatted with Ed Rudy just before their performances at Carnegie Hall in New York City. Unlike many of the other American news reporters at the time, Rudy was no stranger to Rock and Roll, which seems to set the Beatles at ease during their conversations with him. Ed Rudy was a broadcast personality and news announcer, and was the only American reporter to travel with the Beatles for their entire first American visit. Segments of his interviews with the group were aired nationwide on Radio Pulsebeat News as a series of on-going reports. In 1964 and 1965, Rudy would release his interviews with the Beatles on full-length LPs which charted respectably during the height of Beatlemania in America. These historic recordings have recently been reissued on CD. RINGO: "We go to Australia, and we go to Israel and South Africa next year. And we also have a holiday. In fact, THIS was a holiday until we got booked for America." Q: "Paul, What do you do about the reaction from teenagers?" PAUL: "The main thing is, we keep calm. I dunno. You can look at it in two ways. You can look at it just as a thing that's happening and take it in your stride, or else you can sort of get nervous by it and then you get worried. We try and keep it calm." PAUL: "It'll be about us, and things. The story's been written by Alun Owen, an English playwrite -- very good. It should be quite a good story and a good film all around." Q: "Have you been out since you've been here?" PAUL: "I dunno, with the police hanging around all the time." PAUL: "We've been out to one or two clubs. Not exactly dating, but we met one or two girls, you know. We didn't go out WITH girls, we met girls in the clubs." Q: "What are your ambitions?" PAUL: "We used to have LOTS of ambitions. You know like, number one records, Sunday Night At The Palladium, Ed Sullivan Show, go to America, you know. All kinds of ambitions like that. I can't really think of any more. We've done an awful lot of them at the moment. (pause) To be havin' a laugh. To be happy." Q: "John, do you find that the reaction here in the United States is very different from what you experienced back home? The reaction of the teenagers." JOHN: "No. I find it very similar, only over here they sort of went wilder quicker, you know. In England we sort of had to go 'round, and you know, we toured and things like that and got known. But I suppose the publicity helped a lot here." Q: "Yeah, you were pretty much pre-sold when you came over here, uhh..."
JOHN: "Well, it could have killed us, as well. You know, I mean, we could have just come over and got off the plane, if they said 'We don't want to know about THAT,' you know, 'Look at 'em, we don't...' Publicity can do a lot, but you can't sell anything if the kids don't want it." Q: "The whole reaction has been fantastic. Do you feel that it's a fad? Would you call it a fad?" JOHN: "Oh, obviously. Anything in this business is a fad. I mean, we don't think we're gonna last forever. We're just gonna have a good time while we last, you know." Q: "Will you call it a fad that should last a long time?" JOHN: "Well, you know, something that's got this wild, whatever people say about it -- 'You'll die tomorrow,' we could go on working for another five years, even if not at this rate, and make a lot of money, you know. Obviously it's gonna level out. People say 'You're gonna die next month.' You might'nt be as popular but (giggles) you know, you can go on and on from this peak, I think." Q: "It's pretty difficult for me to determine exactly what the Beatles sound is. I like rock and roll, I'm not putting it down, but I don't really understand what is the Beatles sound. Can you define it for me?" JOHN: "Well, as far as all of us are concerned, there's no such thing as the Liverpool sound, the Mersey sound, or even a Beatles sound, you know. It's just a name that people tag on. It's just us playing rock and roll. The only difference is, we wrote it. You know, that's the only difference. Most of it, anyway. We didn't write all of it." Q: "Do all of you write, John?" JOHN: "Paul and I do most of the writing. George has written a few. Ringo hasn't 'cuz (giggling) it's hard to write something on the drums, isn't it." Q: "Yeah. And you do your own arrangements, I assume?" JOHN: "Yeah. Well, we arrange them in the studio normally, you know. We get a basic idea, because you write a song and you get a sound in your head that you think it's gonna sound like. And it usually turns out different, you know. We've given up trying to plan it too much before we go in. None of us can read music. Our A&R man (George Martin) can read music, so sometimes he'll say 'That note's just... it doesn't work, you know. You can't have it.' And we have to go into detail with the piano and everything and work it out and say 'It DOES work. You know, we're singing it. It works.' And sometimes he's right, sometimes he's wrong, you know. (giggling) But it usually all works out in the end." Q: "If you can feel it, then it sounds good. Is the way you feel?" JOHN: "Yeah. I mean, sometimes you THINK you feel it, and you listen back and it doesn't happen. You were really feelin' and you're swingin' and it doesn't happen. But when it does, it's great."